So, I've been in the mood for an easy holiday craft that Lo and I could do together this weekend, and this winter, snowflakes seem to be the thing. We don't currently have any white stuff on the ground, but I know it's coming! 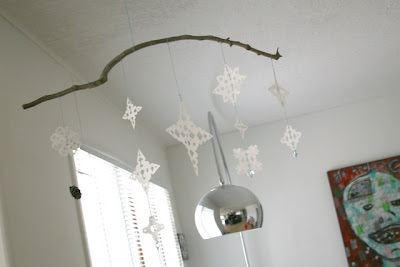 I first caught a glimpse of Gifted magazine on Creature Comforts, and saw this branch/snowflake mobile idea and knew it would be just the thing for us to try. Branch? We've got plenty of those. 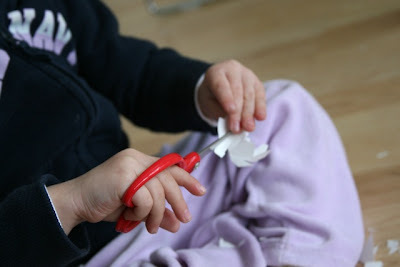 Paper cutouts? Perfect time to practice using safety scissors. Yes, Childcraft. Make and Do. Volume 11. For those of you who also owned that little library of goodness in the 80s. We threw in some pine cones and sparkly beads to serve as weights on the end of each string of our mobile. Oh Jen! They are wonderful and they made me choke up too! 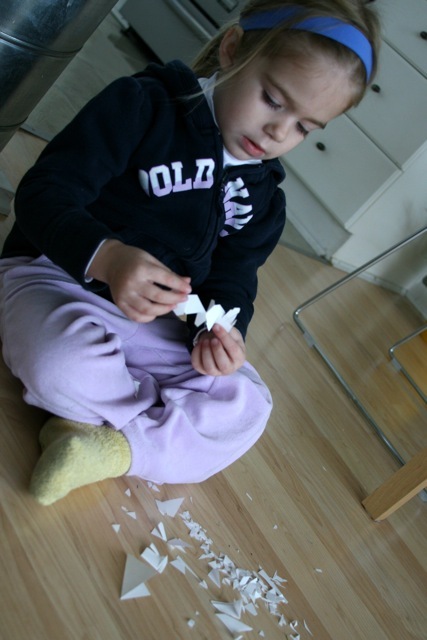 I came home from work one day- over 10 years ago now- and my husband had made snowflakes with my daughter, Teagan, and they had hung them up in the living room. They were the first things you saw when you walked in the front door, and I had forgotten all about them until I read this post and saw your pictures just now. What a beautiful gift you've given me. Without even knowing it. I have watched my kids cut snowflakes out of paper many times the past several winters, but for some reason I didn't think about this great memory until I saw your pictures here. 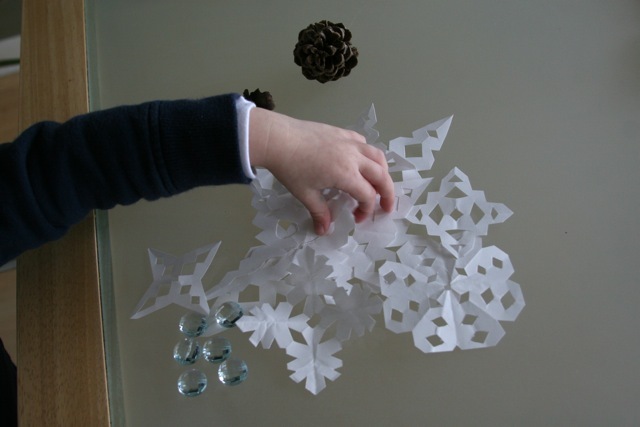 Needless to say I am inspired and wowed that something as simple as paper snowflakes can stir a heart in such an amazing way. Thanks for posting this. I will have to make an indoor snowfall a part of our holiday season for sure this year. Enjoy your holidays! 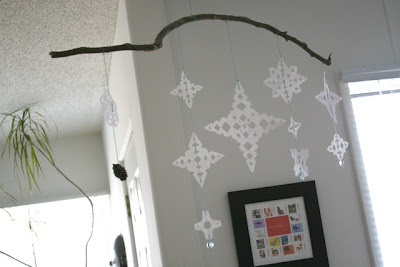 love this - totally bookmarking to do w/ my boys! Very inspiring! 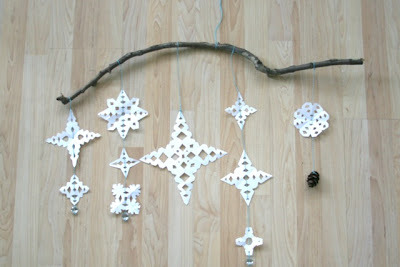 I did this with my daughter today and although they don't look as pretty as yours they were lots of fun & she loved it! Thanks for sharing!!!!!!! Great project! 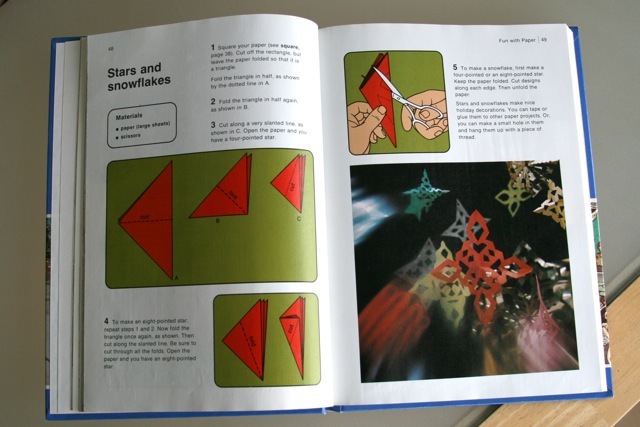 I LOVED my aunt's collection of Childcraft books...make and do was easily my favorite! We have 'the real thing' here in Holland, but that stuff is way too cold! I LOVE the paper snowfall far more! Gorgeous! 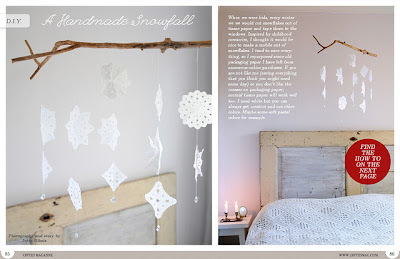 What an awesome idea - I love that mobile! Oh, and thanks for the memory jog...my sis and I made good use of Childcraft's Make and Do, Volume 11 book; easily one of our faves (I'll have to see if Mom still has it stashed away somewhere!). So pretty!!!!!!! I love this idea. So cute!! Lo is adorableeeeeee!